Capitalizing on leads is a core component of a successful B2B campaign, and deploying an automated deal registration program is one of the best ways to achieve such opportunities. By implementing deal registration into your business strategy, you not only increase sales but, also help to eliminate channel conflict, maintain channel partner-transparency and accelerate work efficiency. However, in today’s ultracompetitive B2B landscape, entrenched with market saturation, infeasible consumer demands, and low competitor pricing—proper implementation of deal registration requires a sophisticated, yet easily comprehensible module. Simply put, the traditional process – or manual method – of deal registration is no longer a realistic alternative. In order for vendors to truly retain the benefits of deal registration, the incentive must be automated. Still, an automated deal registration platform isn’t something you can just provide resellers. An automated deal registration program requires specific customization, inserted with extensive – yet user-friendly – features that accurately manage leads and effortlessly eradicate channel conflict. Market experience proves that integrating multiple solutions into your deal registration program maximizes client satisfaction. Recognize that B2B relations are extremely competitive, and allocating a one-dimensional channel incentive program can be a risky – and perhaps toxic – marketing strategy. Other channel incentives or rebate programs include ship and debit, channel gamification, Co-op/MDF management, reseller profile, etc. You can further broaden your incentive program by rewarding resellers that provide your business with the most opportunity. Whether it’s offering additional rebate programs, providing extensive customer support or supplementary margin protection—evaluate your significant partners, and then, reward them for it. Just like the marketplace, people are always moving. Whether it’s traveling, commuting, walking, exercising or sailing—people not only want more access, they require it. After all, capturing information at its source ensures business proficiency and efficiency. 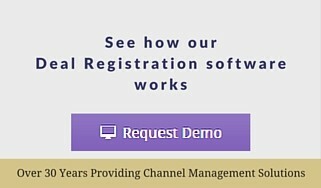 From A to Z (start to finish), your B2B clientele should have the ability to fully manage the registering process. This not only allows you to better evaluate the ‘nuts and bolts’ of each partner but also pinpoints possible insight into areas of your program that may need improvement or require additional integration. The human mind is a fickle specimen. Concentrate on designing a program with an extensive, aesthetically pleasing dashboard that allows your resellers to swiftly analyze the essential data, without losing their attention. Establishing a structure (which maintains consistency) into your deal registration software is absolutely essential. In the business world, transparency is what further extends partner loyalty/relations; make sure to automate your program so that it retains fairness and monitors rules equally. Computer Market Research (CMR) brings 33 years of experience into the indirect channel sales industry. Through our state-of-the-art software, businesses can amplify their B2B marketing efforts via clear and concise content that assists organizations to manage channel data, optimize trade promotions, and build effective distribution channels.